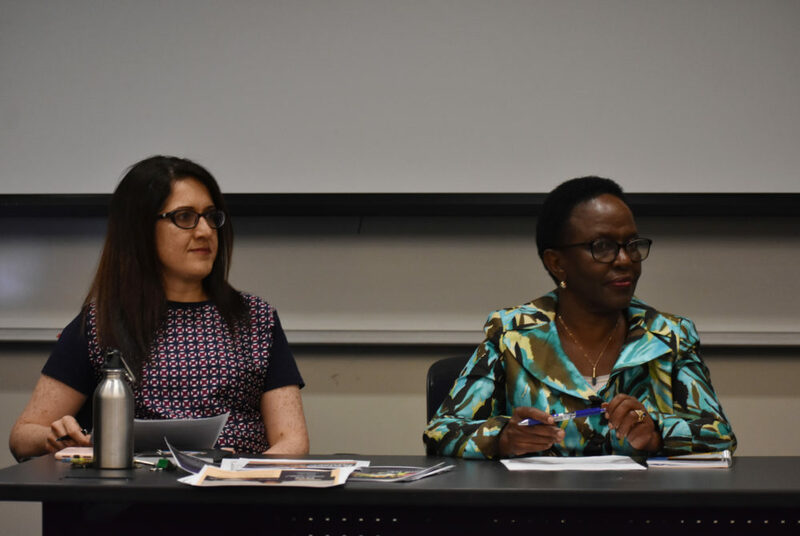 Kavita Daiya, the director of the Women’s, Gender and Sexuality Studies program, and Liberata Mulamula, the acting director of the Institute of African Studies, spoke at an event about female refugees in the School of Media and Public Affairs. A group of professors discussed the experiences of female refugees at the School of Media and Public Affairs Tuesday. The event featured four professors from different academic departments who discussed stereotypes surrounding refugee women and the difficulty refugee women have in obtaining items like sanitary products and child support. Fidan Baycora, a junior and member of the Feminist Student Union, moderated the event. Liberata Mulamula, the acting director of the Institute of African Studies, said refugee women are often denied services, like sanitary products and support through childbirth. She said the lack of services could lead to increased infant mortality rates. Sudha Rajput, a professor in the Elliott School of International Affairs who teaches a course on the refugee and migrant crisis, said refugee camps are often not accommodating to women. Families have to stay in large community halls that separate families with curtains, forcing women to change their clothes in front of male family members. Rajput said the women she encountered in refugee camps in Georgia and Azerbaijan have to take care of their children alone because their husbands would often have to travel to other towns to financially support their families. “It gave me a good lens to see how females in the camps use their coping skills, use their management skills, to help their spouses, to help to manage the crisis of displacement,” Rajput said. Kavita Daiya, the director of the Women’s, Gender and Sexuality Studies program, said displaced people should be referred to as “stateless” people instead of as refugees to avoid blaming the individuals and shift the focus to the root cause of displacement – their country’s actions. Panelists also discussed how the stereotypes associated with displaced women negatively impact them as they try to settle into their host communities. Syed Ali, a professor of anthropology, said racist phrases like “civilizing the savage” and “white men are saving brown women from brown men” are prevalent in Western society. He added that these incorrect views, which lead to Western military intervention in developing countries, have disproportionately impacted Muslim women fleeing political turmoil. He said some members of Western society are reluctant to accept Muslim women because of public displays of religiosity like the hijab, a religious head covering.